and 10 percent proportion of international faculty and students and proportion of inbound and outbound exchange students. The Quacquarelli Symmonds (QS) ranking of Asian universities for 2012 is now available. 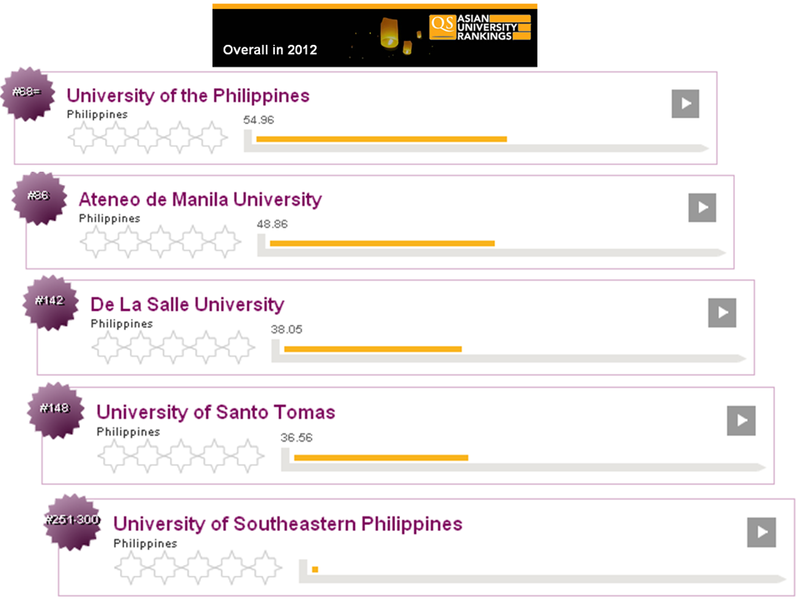 Five schools in the Philippines made it to the list of the top 300. In 2011, UP ranked 62nd; ADMU, 65th; UST, 104th; and DLSU, 107th. This year, University of the Philippines is 68th, Ateneo de Manila University ranks 86th, De LaSalle University, 142nd, University of Santo Tomas, 148th. All four schools have dropped in this year's ranking. The University of Southeastern Philippines in Davao City made the list for the first time. This year marks the second phase of the implementation of the new K to 12 curriculum by the Department of Education in the Philippines. The new curriculum aims to address the problems of Philippine basic education. Although the additional two years at the end of high school are not yet in place in all schools, significant parts of the current 10-year education program have been changed this year. 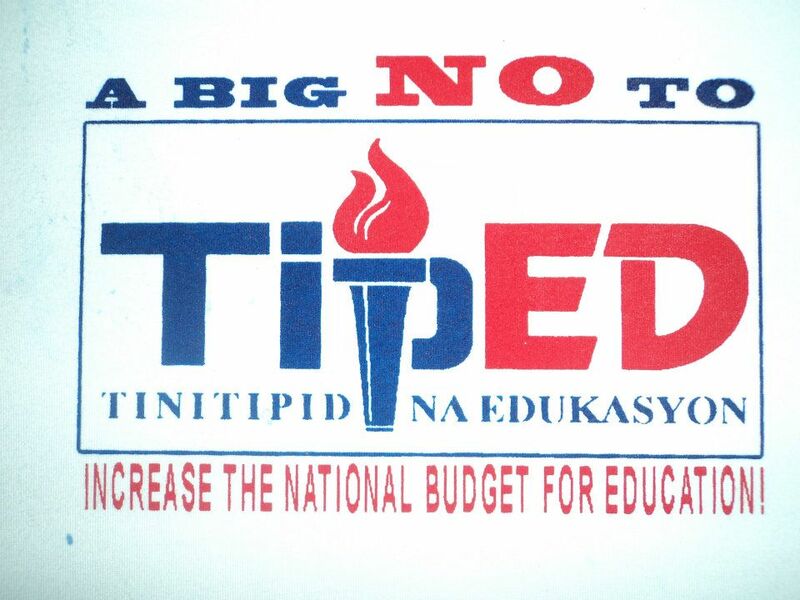 Still, DepEd is determined to push its K to 12 program. The problems remain as the government insists on pushing a reform while neglecting two very important ingredients: (1) seriousness as seen in funding and (2) listening to the voice of the people. One additional year, kindergarten, has already been formally added to the basic education program of the country. 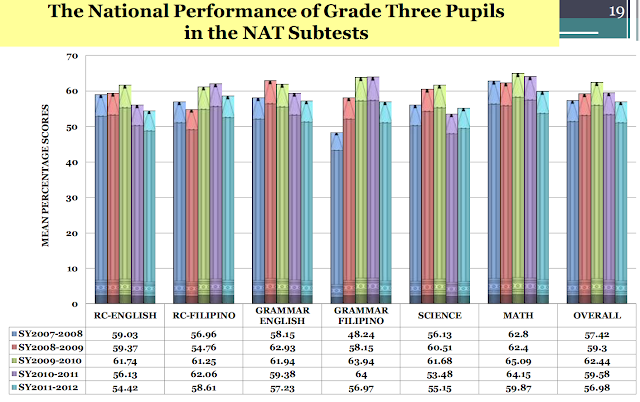 One can evaluate the sincerity and the determination of the Philippine government in this area in "The State of Kindergarten", http://philbasiceducation.blogspot.com/2012/06/state-of-kindergarten.html. Volunteer teachers are paid 3000 pesos a month and in most cases, this payment is even delayed. 100000 kindergarten teachers paid at a much more respectable rate of 15000 pesos a month will cost the government 18 billion pesos a year. 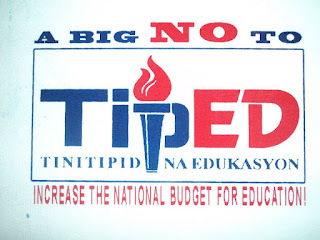 Since kindergarten represents at the moment a tenth of the country's basic education program, 18 billion pesos for kindergarten teachers will represent a serious and thoughtful implementation of DepEd's K to 12 program. Unfortunately, DepEd's K to 12 does not have the funding that is required for the program to be implemented in at least a satisfactory manner. Kindergarten is the first year of DepEd's K to 12, yet, it does not receive the tools it requires to succeed. The spiral approach has also been scrutinized in the US and Canada (please read: http://philbasiceducation.blogspot.com/2012/04/depeds-spiral-curriculum.html and http://philbasiceducation.blogspot.com/2012/06/why-so-many-elementary-students-arent.html). The short instructional hours which the new DepEd K to 12 have been clearly matched by multiple shifts in schools, http://philbasiceducation.blogspot.com/2012/06/first-day-of-school-deped-k-to-12.html. This continues even as voices from around the world are united in stating how important time well spent in schools is in educating the youth, http://philbasiceducation.blogspot.com/2012/06/listen-to-voices-of-teachers.html and http://philbasiceducation.blogspot.com/2012/04/wisdom-behind-short-school-hours.html. 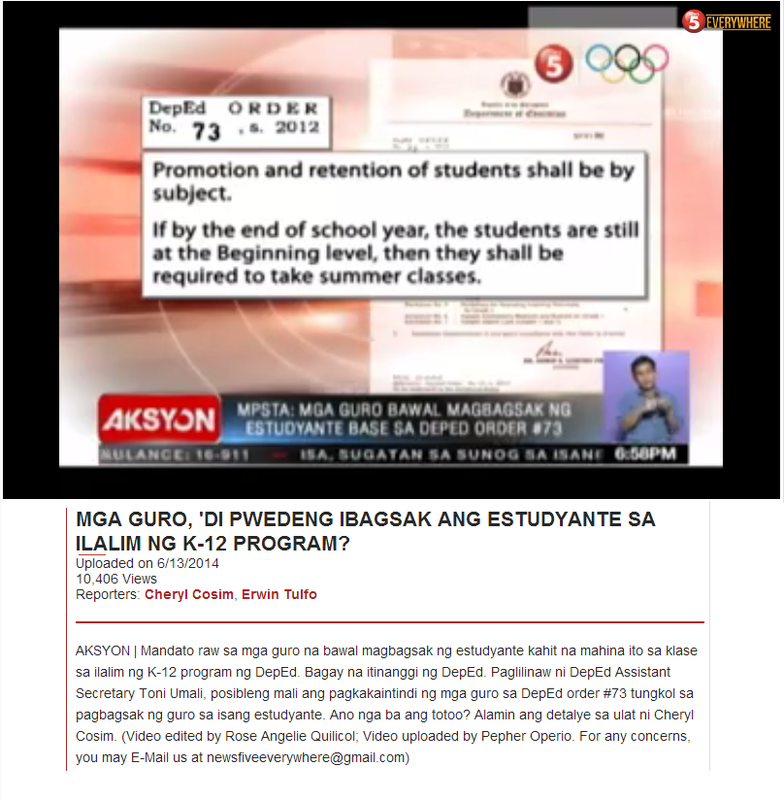 All these changes will only worsen basic education in the Philippines. "...Another identified problem is the low rate of program accreditation among programs of colleges and universities. Although accreditation is voluntary, less than 20 percent of the Higher Education Institutions have accredited programs...."
Problems in basic education can not be addressed properly if the problems in higher education are not addressed first. "Without higher education basic education cannot progress...." - Bikas C. Sanyal explains this in the Role of Higher Education. Basic Education reform can not succeed without teachers. Teachers are produced by Higher Education Institutions. This is the place where reforms must begin. Teachers can not teach without just compensation. Before any curricular reform, this likewise must be addressed first. This article has a lot of worthy points. This was a big chance to help the student success and attaining their goal in life. For me, this program might be the solution in Philippines Education. Thanks for sharing this with us.